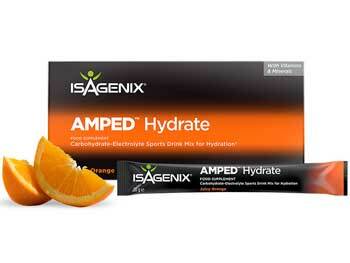 Isagenix AMPED Hydrate £ £24.00In stock! Order now! 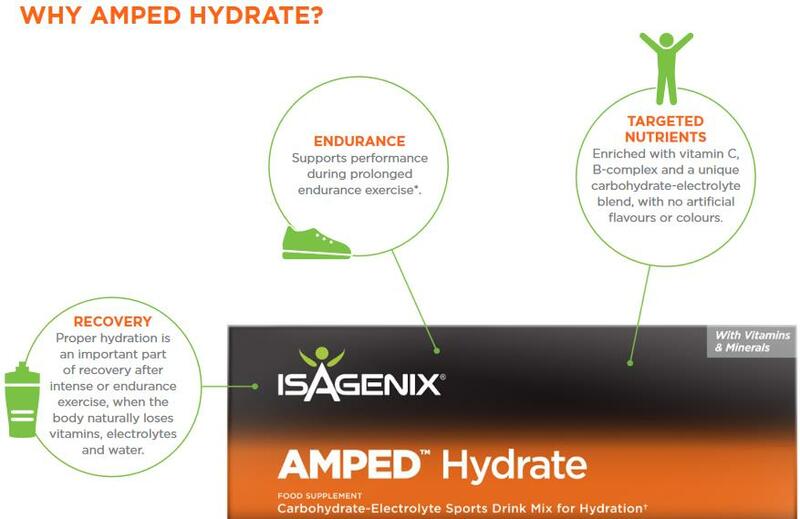 AMPED Hydrate is Isagenix’s latest and greatest take on the sports drink, bringing the power of science and nutrition right into the palm of your hand. Much more than a refreshing beverage, this cutting-edge sports drink re-hydrates, re-energises, and delivers much needed nutrients and electrolytes water or other sports drinks simply can’t provide. If you want to take your workouts to a new level and kick your performance into high gear, AMPED Hydrate will keep you going every step of the way. With AMPED Hydrate, you’ll enjoy more energy, increased endurance, better performance, and faster recovery times, allowing you to get the most out of each and every training session. In addition to B vitamins, vitamin C, and electrolytes, AMPED Hydrate contains a unique glycogen complex and a specially formulated blend of healthy, fast-absorbing carbohydrates to help fuel your performance and reach your fitness and performance goals. With AMPED Hydrate, you’ll stay naturally hydrated and replenish your body with vital nutrients and electrolytes lost during each training session. In other words, you’ll recover faster and feel better before and after every workout. Like all Isagenix products, AMPED Hydrate contains no artificial flavours, colours, or sweeteners. This refreshing and refueling sports drink is also dairy-free, gluten-free, soy-free, and vegan-friendly. Why Hydrate with AMPED Hydrate? Hydration is an essential aspect of maintaining your health. However, if you’re an athlete, it’s something you simply can’t overlook. Perspiration and loss of body fluid can result in lethargy, lack of concentration, decreased reaction time, and hindered performance. Furthermore, sodium loss through sweat also contributes to dreaded muscle cramps. AMPED Hydrate solves this dilemma. Developed to help restore proper water balance within your body and provide it with the carbohydrates, vitamins, nutrients, and electrolytes it needs to perform at its best, it’s an ideal sports drink for any serious athlete or active adult. How Does AMPED Hydrate Compare to Other Sports Drinks? While many sports and energy drinks are loaded with sugar and caffeine that more often than not can cause you to crash, this specially formulated sports drink allows you to naturally sustain your energy levels without sugar and harmful stimulants. This means you’ll never crash and experience anxiety, the “the jitters,” or any other negative side effects that may hinder your performance and well-being. Instead, AMPED Hydrate nourishes and replenishes the body with essential B vitamins, vitamin C, and electrolytes to help you perform at your very best and reach your fitness goals. That being said, what really makes this sports drink stand out is its effective glycogen complex blend, which helps retain liver and muscle glycogen stores, resulting in the ability to perform at peak levels for longer periods of time. Best of all, AMPED Hydrate tastes great and is only a meager 35 calories per serving. AMPED Hydrate is a sports drink mix available in powder form. Pour the contents of one stick into a glass or sports bottle of cold water and shake or mix with a spoon. Enjoy before, during, and after any workout or training session. If you want to make the most out of every single workout and perform at your peak, purchase AMPED Hydrate direct from Isagenix and reap the rewards. All products are shipped from local warehouses right to your door in no time at all. From Cardiff to London, if you live in the UK, it’s time to join the Isagenix revolution and take your performance to a whole new level starting today! How Much is AMPED Hydrate? Isagenix AMPED Hydrate can be purchased for £33.34 per box at full retail prices, or sign up with us (UK’s #1 distributor) and pay just £25 per box. Each box comes with 24 individual sachets. Read Isagenix AMPED Hydrate reviews from real Isagenix UK customers!